A couple weeks ago, Warner Bros. invited us to attend the press junket for The Campaign. 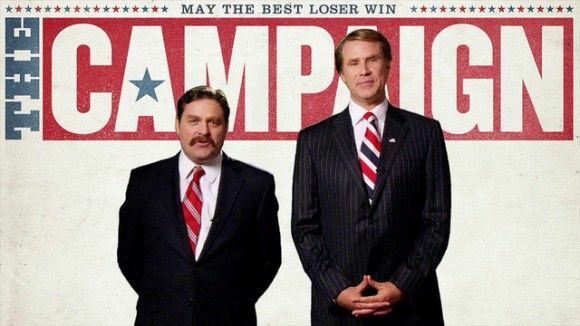 The R-rated comedy stars Will Ferrell and Zach Galifianakis as two politicians who keep finding hilarious new lows in order to win a district election in North Carolina. For more on the film, click here for all of our previous coverage. During my on-camera interview with Dylan McDermott, who plays an intense political operative, we talked about where he drew inspiration for his character, working with actors who are constantly improvising, a particularly scene where everyone kept cracking up, his upcoming White House thriller Olympus Has Fallen, and more. Hit the jump to check out the interview, and click here for my interview with Ferrell and Galifianakis. The Campaign opens Friday. 0:16 – Where he drew the inspiration for his character. 0:57 – The experience of working with actors who are constantly improvising. 1:30 – A particularly difficult scene to film because people kept cracking up. 2:13 – How the finished film compared to what he envisioned when he first read the script. 2:59 – His role in Olympus Has Fallen.